Buildings, homes and landscapes make the community beautiful and our Sudbury graffiti removal wants to help keep it that way. Residents of Sudbury take pride in their homes and businesses and rightfully so! These properties are your first impressions to the world outside and our Gorillas will make sure you are always able to put your best foot forward. The unique graffiti removal techniques used by our technicians require special care. We use only the most appropriate tools and solution for your property. The internet is full of “DIY” or “quick-fix” methods of graffiti removal but these make an even bigger mess! When applied, improper solutions ruin your property. More often than not, loosened paint colour leaks down the outside of your property. This leaves a much larger stained area on your property, instead of one concentrated spot. Overspray is another issue that home or business owners have to face alongside their main stains. Overspray occurs when paint flecks escape the outer area of the aerosol spray. The prominent graffiti is removed, but overspray is often neglected. Significant shadowing can be left behind in this process. 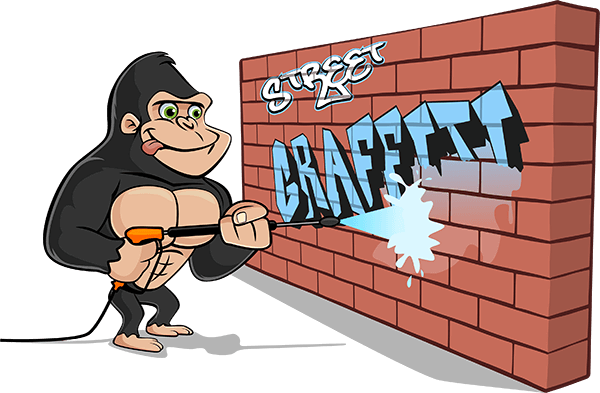 Gorilla technicians are well-versed in all graffiti removal methods. This experience ensures the best possible outcome for your property. Our Gorillas use a multi-step program to ensure complete removal of all traces of your unwanted paint. The arts are alive and well in Sudbury but each piece has a time and place. Local art has a special place in the heart of Northern Ontario’s largest city. Two art galleries hold on to the prized pieces of local artists, The Art Gallery of Sudbury and La Galerie du Nouvel-Ontario.